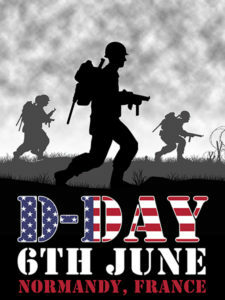 On June 6, 2019, our community will come together to remember the service and sacrifice of US servicemen who fought in “Operation Overlord”. On June 6, 1944, over 2,499 US servicemen lost their lives during the invasion of northern France, including 100 Texans. Twenty-five of these Texans came from the DFW region, including one from Collin County. Operation Overlord was a joint military effort between the US, Great Britain and Canada to push Nazi Germany away from the northern shores of France. The invasion began on June 6, 1944, becoming known as D-Day. It involved over 160,000 Allied forces landing along a 50-mile stretch of beaches near Normandy, France, including 73,000 U.S. servicemen. Over 5,000 ships and 13,000 aircraft supported this invasion. Outgoing President, Alan Kravitz, was thanked for his service to and leadership of the WHOA. Following the Annual Meeting, Chip Lipscomb, City of Plano Community Investment Program (CIP) Engineering Manager, presented plans for upcoming replacement of screening wall along Legacy. He expects the project to start within next few months although he could not provide a firm date. The entire project will require 4 months or more to complete and will also include replacing alleys along the screening wall. Clay provided his contact information and encouraged any Whiffletree resident to contact him with any questions about the project. (Refer to the DETAILED RECAP of the Annual meeting for more information. This appears in the side-bar on the right side of this page). On February 20, Plano Neighborhood Services held a workshop to assist Homeowners Associations (HOAs) to apply for and be recognized with BEST Neighborhoods Designation. As part of the workshop where Neighborhood Services personnel described the application process and key factors in the evaluation process, Whiffletree HOA (WHOA) was asked to present to the attendees how Whiffletree achieved Platinum level (highest level) recognition by the City of Plano. Bill Ostergren, WHOA Treasurer, and Tom Dixon, WHOA Beautification Committee Chairman, presented to the audience of over 30 people, representing more than 10 HOAs. Whiffletree was the only HOA presenting to the group. The presentation was very well received and triggered several questions (CLICK HERE to view the WHOA presentation). WHOA was honored to make this presentation and share its experience with the BEST application process and to showcase what a fantastic neighborhood Whiffletree is. Special thanks to Tom Dixon and Bill Ostergren for their work on preparing the presentation and for such an outstanding job of communicating what Whiffletree does to make it an exceptional neighborhood. Great job guys! The WHOA Winter Social was held on Jan. 21, at Napoli's Italian Restaurant. Pictures from this event can be viewed by CLICKING HERE TO VIEW PICTURES. The Winter Social was attended by 104 Whiffletree HOA members and has been a long-time annual event sponsored by the Whiffletree HOA for neighbors to meet neighbors in a fun, social setting. By all reports, everyone enjoyed the classic Italian meal and the opportunity to meet their neighbors. Alan Kravitz, Whiffletree HOA President, welcomed all the attendees to the Winter Social and highlighted that this is the premier annual event for the Whiffletree HOA and was so happy to see such a great turnout. Thanks to Karen Slott for organizing this event and Napoli’s management and staff for the great food and service. 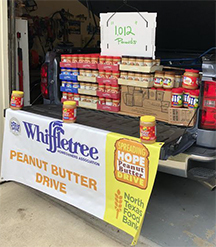 Thanks to the enormous generosity of Whiffletree families, we collected 1,012 lbs. of peanut butter for the North Texas Food Bank. It was an amazing effort, nearly double what we collected last year. We received congratulations from Mayor Harry LaRosiliere’s office, from Plano Neighborhood Services, from the North Texas Food Bank, and from Davis Library staff. Whiffletree residents were very generous and we should all be very proud of our neighborhood. Many thanks for all of your many generous donations. Our residents proved once again that we have a lot of heart and that we deserve our BEST Platinum designation from the city. Most important, our drive supporting the North Texas Food Bank will feed a lot of hungry Collin County residents. Thank you all very much! The Whiffletree V-VII Homeowners Association is a residential subdivision comprised of 477 homes. It is a family-oriented neighborhood which is located just north of Legacy Drive, east of Coit Road in Plano, Texas. Any resident of the Whiffletree V-VII neighborhood can become a paid member of the Homeowners Association. It doesn't matter if you are renting or if you own your home. We welcome all residents. We want to formally welcome all new residents and hope each of you finds caring neighbors and a friendly atmosphere that add so much to the quality of life here in Whiffletree V-VII. 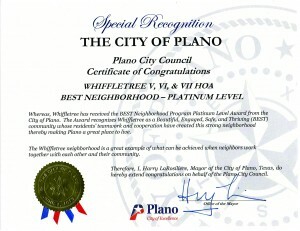 Whiffletree is a 2016 “Plano BEST Neighborhoods,” Platinum Award recipient! We were formally recognized by the Mayor and the Plano City Council at their meeting on December 12, 2016. Platinum is the highest recognition level, and only four Plano neighborhoods received it. Of the four, we are the only one with a non-mandatory (voluntary) Home Owners Association. This is a very proud moment for Whiffletree V, VI, VII and we want you to share in the excitement! 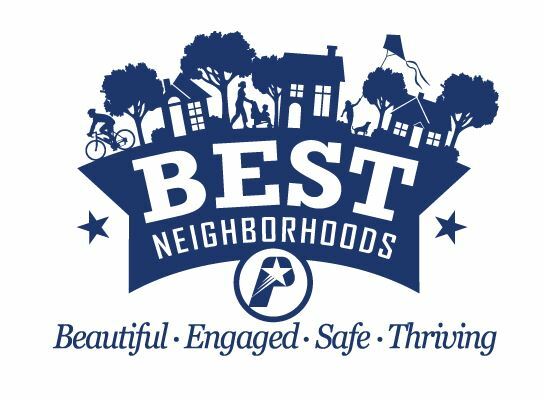 For more information about the “BEST” program and the award presentation visit www.plano.gov/2893/BEST-Neighborhoods-Designation. Thank you to all of our residents for your support of our Whiffletree neighborhood. Where: Hardy Room, 7501-A Independence Pkwy (Building next to Davis Library). Oct 2 National Night Out - 6-8 PM at Prairie Meadow Park. We are permitted to water a maximum of twice per week. Avoid watering between 10AM and 6PM and when rain is in the forecast. Even addresses can water on Mondays and Thursdays. Odd addresses can water on Tuesdays and Fridays. A Credit Card or Paypal can be used to pay your annual HOA dues. To do this, click on the PAY NOW button (appears below). If you prefer to mail a check, make the check payable to "WHOA" in the amount of $120 and mail this to PMB 288; 3948 Legacy Drive, Ste. 106; Plano TX 75023-8300. Thank you for your support. 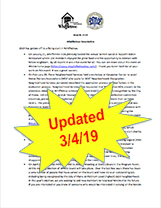 For all current and potential residents of the Whiffletree V-VII Homeowners Association, a copy of the organization's BYLAWS can be viewed by CLICKING HERE. For a recap of the National Night Out 2018 Event, CLICK HERE. To view a detailed recap of the Annual meeting, CLICK HERE.